I thought I should also mention that here in the US, Master System games are pretty hard to find, even on eBay. So if you search for a given game on any given day, you might not find a copy as an auction, but if you scroll down, you might find some in the eBay stores. Also, other countries got a number of excellent games that we didn’t get here in the States, some of which might be quite affordable there. Before there was Sonic the Hedgehog, there was Alex Kidd. This monkey-like boy in the red jumpsuit was Sega’s mascot in the early years. 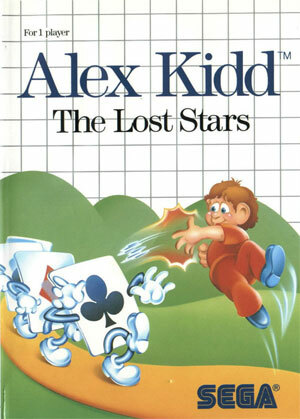 Alex Kidd: The Lost Stars is a bit of a departure from the original Alex Kidd game (which you can find below in the Slightly Over $10 Section) – ditching all of the block smashing and vehicle riding in favor of a more straightforward run-and-jump approach. As a result, it feels even closer to Super Mario Bros. than the original, which actually results in a satisfying experience. In the third Alex Kidd installment, Sega thows in some blatent self-promotion, as the plot of High Tech World is to guide Alex to an arcade to play the latest Sega games. This game is, once again, entirely different from its predecessors, being half puzzle-solving adventure and half-action. Yes, the 8-bit era was filled with platformers-a-plenty. As if Alex Kidd and Sonic the Hedgehog were not enough, we also have another gem of a series called Wonder Boy. The main character in Wonder Boy is known as “Tom-Tom” – a caveman-like character whose girlfriend has been captured by a monster. The player must guide Tom-Tom through nine areas (each with multple rounds) made up of forests, hills, oceans, caves and ice palaces. One of the Master System’s strengths over the NES was it’s high-quality arcade ports. Sega also had a healthy selection of solid arcade titles to bring to their home console. Outrun is one of the leaders of the pack with it’s high-speed action and trademark style. This slimmed-down Master System port plays just like the arcade, even if it isn’t powerful enough to pull off the smooth graphic effects. The scrolling is relatively good for an 8-bit system and the music sounds decent. While most air combat simulators can be rather boring, Sega took all the complexity out of flight and turned Afterburner into a straightforward arcade title filed with nothing but blowing up enemies and dodging incoming attacks. The Master System port can be a bit disappointing, but it’s a cheap thrill and a good piece to add to your collection without spending much cash. If you like the pseduo-3D air-based combat style of Afterburner, but would like a more colorful and trippy environment with creative enemy designs, Space Harrier is just for you. The scrolling was a bit choppier than the arcade on the Master System but, the huge enemies managed to look pretty impressive for the time. For the most part, the enemies and levels are comparable to the arcade version, although Sega added an additional final boss and a real ending. The Sega Master System was also the first home console to experiment with virtual reality in the form of 3D glasses. These spectacles were little more than an electronic variation of the red/green or red/blue 3D spectacles used by thrill-seeking moviegoers back in the 1950s. Each lens would rapidly strobe between opaque and clear, and this was carefully timed to correspond with identical rapid shifting of on-screen graphics imagery to simulate a 3D environment. Gamers raved about them (and still do), because they provided a very immersive experience. Space Harrier is probably one of the best values of the limited selection of 3D games and is a novel treat for any Master System owner. Sega wasn’t the only one to bring some good arcade ports to the Master System. Everyone’s favorite oversized creatures and the buildings they destroy look so much better on the Master System than they do on the NES version. This one actually looks like the original arcade game. If you enjoy old-school brawlers, you can’t help but love Double Dragon. This pioneering beatemup has many memorable moments and, like Rampage and others, looks much more arcade-authentic than the NES port. The NES game may get higher scores in the fun deparment, however, as the Master System version controls aren’t all they could be. The original Alex Kidd is a defining game for the Master System and is still good for some platforming goodness. This landmark Sega game is a cornerstone for any Master System collection. To give your Master System a little variety, take a look at Spellcaster, a Action/Adventure/RPG that has a number of fans to this day. Even though Shinobi was actually ported to a number of different consoles, it’s right at home on the Master System. This ninja-filled 8-bit adventure is fun, challenging, and a good showpiece for the SMS. I used to have quite a large collection of SMS games (almost a complete US set). It’s quite the challenging system to collect, especially looking places other than eBay. If you can find a working pair of the 3D glasses all of those games are worth getting just for the retro “wow” factor. Missile Defense 3D is my favorite one. The Wonderboy sequels are as solid as almost any game on the NES and not near as hard to find as Phantasy Star. I think if you find and SMS II it has Alex Kidd in Miracle World built in, which is also a great game. Great call on Spell Caster. Golvelius is not incredibly hard to find either, but not really rare. Funny story about my SMS collecting… I went to my favorite used game shop and finally found a complete copy of Phantasy Star. I put it in my SMS and it was MONOPOLY! Someone had switched the cart… I thought it was $30 down the drain, but I actually sold just the box and instructions for quite a bit a few years later on eBay. I just picked up Rastan recently in order to test out my new Master Gear converted. It’s pretty decent, although it’s blurry as Hell on GameGear. The european version of the sms games,are compatible with the american sms. Only Prince Of Persia,Jungle Book and Back to the Future III don’t work on US system. The PAL games are more cheaper then us version,because the Sms have a great success in Europe..
With 5€ max 10€ you can buy the Sonic series,Mortal Kombat 1 or 2,Robocop vs The terminator,Marble Madness,Batman Returns,Lucky Dime Caper,Alien 3,Cool Spot and many more. The games that you have listed, are of the first generation, therefore not the best games on Sms. Sorry for my bad english,i’m italian! GREAT call on Zillion! It is one of my all-time favorites. Also nice to hear mention of Spellcaster. No mention of Psycho Fox, Phantasy Star, Miracle Warriors or Wonderboy III? Also, what about the Fantasy Zone series? Galaxy Force was one I really liked. The speed and colors really seemed to put any NES game to shame.